West Haven is located approximately 35 miles (56 km) north of Salt Lake City, west of the Wasatch Mountains in northern Utah. The confluence of the Weber and Ogden Rivers is located inside the northeastern portion of the city. The city is bordered on the east by Ogden, on the south by Roy, on the west by Hooper, and on the north by Marriott-Slaterville. 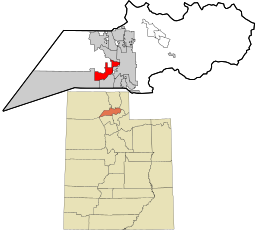 It is part of the Ogden– Clearfield, Utah Metropolitan Statistical Area. According to the United States Census Bureau, the city has a total area of 10.2 square miles (26.3 km²), all of it land. The first settlers in what would become Kanesville arrived in 1868. At the time the area was known as Northwest Hooper. Kanesville was named for Thomas L. Kane. The name Kanesville was adopted when an LDS Ward was first organized there in 1882. The first bishop was Peter B. Peterson. Wilson, Utah was formed in 1854. It was named after the four Wilson brothers who began farming in the area in 1854. An irrigation company was formed in 1879 and an LDS Ward was organized in 1882. The first bishop was Brigham Heber Bingham. As of the census  of 2000, there were 3,976 people, 1,131 households, and 995 families residing in the city. The population density was 391.0 people per square mile (150.9/km²). There were 1,220 housing units at an average density of 120.0 per square mile (46.3/km²). The racial makeup of the city was 94.06% White, 0.48% African American, 0.48% Native American, 0.83% Asian, 0.08% Pacific Islander, 2.29% from other races, and 1.79% from two or more races. Hispanic or Latino of any race were 4.85% of the population. There were 1,131 households out of which 52.3% had children under the age of 18 living with them, 79.1% were married couples living together, 6.1% had a female householder with no husband present, and 12.0% were non-families. 9.5% of all households were made up of individuals and 3.9% had someone living alone who was 65 years of age or older. The average household size was 3.52 and the average family size was 3.77. In the city, the population was spread out with 36.9% under the age of 18, 10.0% from 18 to 24, 28.6% from 25 to 44, 18.6% from 45 to 64, and 5.8% who were 65 years of age or older. The median age was 28 years. For every 100 females, there were 103.7 males. For every 100 females age 18 and over, there were 99.8 males. The median income for a household in the city was $57,120, and the median income for a family was $62,188. Males had a median income of $40,264 versus $30,428 for females. The per capita income for the city was $18,089. About 1.3% of families and 1.8% of the population were below the poverty line, including 1.8% of those under age 18 and 2.0% of those age 65 or over. 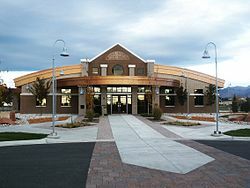 A newsletter from the city's mayor in 2009 noted that West Haven was the fastest growing city in Utah in 2008. Much of the city is zoned for commercial development, particularly along the state highway on 1900 West (directly north of the larger community of Roy, Utah, for which 1900 West is the primary north/south main street), and around the 21st Street/Wilson Lane I-15 exit for Ogden and West Haven. A growing number of businesses are located in the commercial areas (including Wilson Lane and part of Midland Drive) from small shops, larger stores, vehicle sales, repair and service businesses, to small manufacturing operations to substantial enterprises such as steel fabrication. In general, the size and scope of new development projects has tended to increase since the city's founding. The predominant single-family home nature of the residential areas - many of which have been created as developments of various sizes - is being joined by more multi-story multi-family dwellings and condominiums. Some of the old rural nature survives in patches, including farm homes dating back well into the 19th Century, and there are still some working farms raising both crops and animals. A major new road project is extending Ogden's arterial 31st Street which provides a main city access to I-15 into parts of West Haven which have heretofore been less accessible. This project is scheduled for completion in 2010. I-15 itself has been substantially upgraded in the area (during 2006-09), providing excellent car and truck access to the city. ^ "New stake presidents", Church News, October 30, 2010.